This ring, in paper, steel silver and gold marks not just the end of 2010, but the end of the Ring a Day Challenge on Flickr. I enjoyed the fun of making a new ring everyday from any material any method. I made 142of the 365 and used everything from business cards and leather scraps to gold and steel. It's called RAW or Ring a Week. 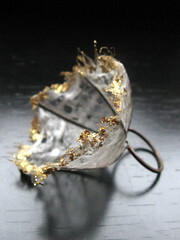 Take a peek on Flickr, join in, you don't need to be a metalsmith just looking for a creative boost to your New Year.